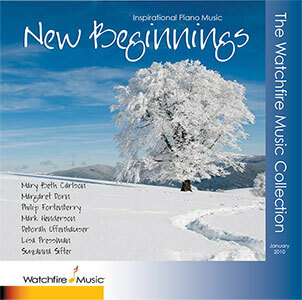 Ms. Carlson’s track,“A Brand New Day” is included on “New Beginnings” CD from The Watchfire Music Collection. This CD features some of the best of our WFM piano instrumentalists. Here is music to get you started on the right foot both mentally and spiritually. Meditational, prayerful and soothing, yet inwardly energetic is the approach to this compilation CD. I really love the instrumental. Thank you! I really love it , thank you!